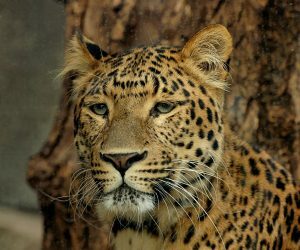 The stunning image is the pride of the Land of the Leopard nature reserve in the Russian Far East has been sent as an entry in the 2017 PhotoTrap Russian competition. Only around 80 of these big cats survive in their natural habitat in the wild due to excessive hunting and poaching during the 20th century. Now, though, numbers are rising thanks to measures to protect the vulnerable cats.